Nearly one year ago, on August 19, 2008, 53 year old Barry Jennings died, two days before the release of the NIST Final Report on the collapse of WTC7. 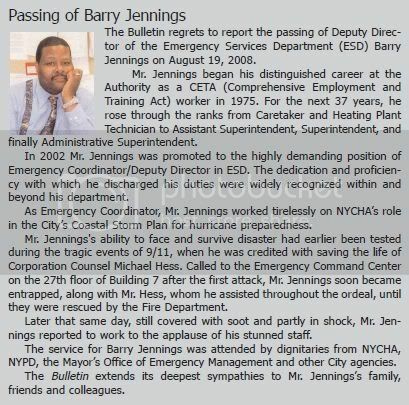 Jennings was Deputy Director of Emergency Services Department for the New York City Housing Authority. On September 11th, 2001, he saw and heard explosions BEFORE the Twin Towers fell, while attempting to evacuate the WTC 7 Command Center with NYC Corporation Counsel Michael Hess. Jennings publicly shared his experiences with a reporter on the day of 9/11/01, as well as in a lengthy 2007 video interview with Dylan Avery, a small clip of which was then released; subsequently his job was threatened and he asked that the taped interview not be included in Loose Change Final Cut.. However, after an interview with Jennings was broadcast by the BBC in their program The Third Tower ostensibly refuting what he had previously stated to Avery, Avery felt compelled to release the full original video interview to show the distortions made by the BBC. The cause of Jennings' death has not been made public, and a private investigator hired by Avery to discover the cause and circumstances surrounding his death refused to proceed with the investigation. In spite of the significance of Jennings' position with NYC on 9/11 and his controversial eyewitness testimony regarding the collapse of WTC7, the media has not investigated or reported on his death, nor reported on his statements. This is a very interesting video and hope that more Americans will watch it to wake them up. I would also like to draw your attention to two more cases. One one the Jersey Girls died in a plane accident in Buffalo last winter and a high ranked officer also died in the train accident in Washington on his way to the Pentagon. Apparently he was in service on 9/11. I don't know if you will post this but maybe I'm crazy but still I'm suspicious. Those responsible for 9/11 surely don't want to get caught. Yes, Barry Jennings, rest in peace. The filing date of this item, "THURSDAY, DECEMBER 31, 2009", robs it of a lot of its credibility as I am writing this comment on November 2nd, 2009, just about two months earlier... If this is due to an error in programming, please correct it. Thank you. I am the one who wrote the previous comment. It suddenly dawned on me that the anomaly concerning the date of this post was not a mistake but, because of constraints imbedded in the Blogger software, it was used to maintain the introduction to this website at the very top of the page and obviously that is what is meant by "Permanent Top Post". Hopefully, a more elegant solution can be found. Anyway, I applaud whoever launched this initiative to gather information about Barry Jennings. I am presently trying to find out how to create a page on Wikipedia. I like the video, there are to many like this one, but a hope with the peolpe see how to do this kind of introductions. I like this topic, so everybody have to see this. I feel someone should come up with a website that lists all the 9/11 witnesses who are mysteriously disappearing from the face of the earth. Barry is not the only one. There are several people who wanted to fight against the govt for the truth have been killed. Their deeds need recognition. Jennings has been trapped in WT7 for some hours, surviving "explosions", collapsed structures, scrambling through rubble, being soaked by fire sprinklers (according to Michael Hess), and breathing in a potpouri of toxins, and shock. He reports in a latter interview that his knees are so swollen that he can't run even to save his live -- so he crawls on his hands and knees. So what happens when he gets out. Ambulance? Hospital? First Aid? No, he waits around for a WABC-TV interview whose interviewer clearly presents him as a 'Twin Towers' survivor and clearly asks him what happened at the moment of impact (plane impact). Jennings does not correct this or qualify that he's in WTC7. Jennings appears to be moving about ok -- given that a short time before he couldn't run for his life. And he doesn't look all that dishevelled. Jennings talks of crying and even starts to break down when relating thinking of his family. So what does he do after this ordeal and the interview. He goes back to work where he says that 'secretaries' clean him up. Jennings never names who called him or who he called, meaning who got him into the building and who got him out. And why isn't he suspicious that he and Hess were led there? And why, if the building had been evacuated were police so helpful in letting them back in? And one last question. In all these suspect dealings why does Jennings come back years later and gullibly give his story to YouTubers? Just questions, don't go nuts. Jennings says in an interview that his knees were so swollen that he couldn't run, even to save his life. Where is Barry Jennings? watch this video of Hess being discovered. why arent we getting anymore info? have you ever heard something about pharmacy ? I think you should add something about that element, shouldn't you? The cause of Jennings' death has not been made public, and a private investigator hired by Avery to discover the cause and circumstances surrounding his death refused to proceed with his investigation. its my opinion that jones and avery either cant contact the family cuz they are not welcome or ignore this fact cuz what they say is a better story . ask your self this , what else are those 2 misleading you about ? lol, "a simple google search" is your astounding proof of your conspiracy theory inception? Does anyone know which hospital Barry Jennings was taken to? No matter how he died, his statements are true. Explosions! This is great article and so helpful.Thanks for stopping in and reminding me!